The more I write on my iPad, the more I appreciate the device for this type of creation. It's portable, easily accessible, and I'm less prone to distraction. And with writing applications making great use of iCloud and Dropbox, my data is always there and always in sync with my Macbook Pro. 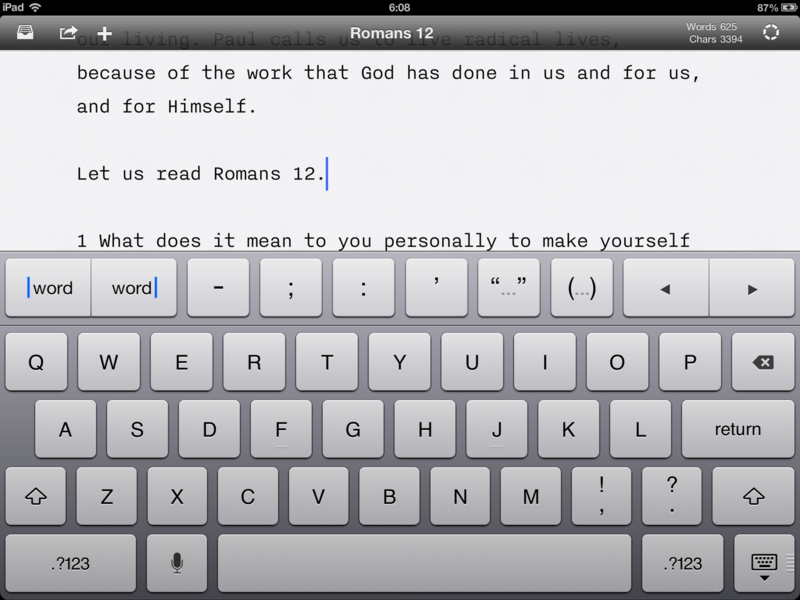 The negative with writing on the iPad is typing. It's a bit of a mixed bag experience — the iOS autocorrection is (at times) brilliant and I can fly along with confidence, knowing the OS is going to correct my typos. But when mistakes are made and are either not autocorrected, or autocorrected incorrectly, then the iPad becomes a less comfortable environment. Now, using a physical keyboard goes a long way to improving the experience. Being able to use the arrow keys one character or one word at a time is a must have. Same for being able to use the Command key with the arrows to move to the beginning or end of a line, or select and entire chunk of text. The various conventions of iOS are well designed; the Loupe for placing the cursor in text, the pop up menu for Select, Copy, Paste, Define etc … these are clever designs solving a real problem for working with text in a touch environment. But overall, as clever as these items are, their usage is still less than ideal. Working with a keyboard is preferred. The problem for me is I've never purchased a keyboard specifically for my iPad. I have one Apple bluetooth keyboard and it's paired with my MBP. I could switch between the iPad and MBP, but as most of us know, pairing bluetooth devices on any Apple product can be a serious chore. Once connected, I tend to leave them as they are. And so to the point of this longwinded article. Because I tend to type on the virtual keyboard, I'd love to see the iOS keyboard improve. Thankfully, Apple already has a well thought out example to rip off follow. The more time I spend in iA Writer, the more I admire the ingenuity of Oliver Reichenstein and crew. The top line on the keyboard adds the functionality that make working with a virtual keyboard more comfortable, removing friction. The two arrows on the right side move the cursor between characters. The two on the left move the cursor between words. Each of these makes navigating your text more efficient than tapping away on the screen. 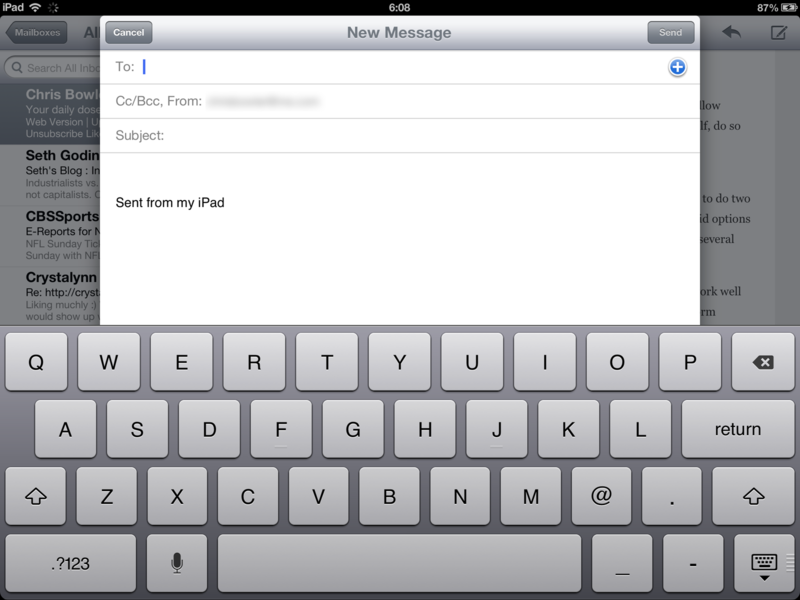 Every time I type out an email on my iPad, I'm reminded of what iOS is missing. Using Mail's keyboard is a significant reduction of efficiency compared with writing in iA Writer. Here's hoping Apple recognizes the better design and embraces the approach.